goodwill-wi-books has no other items for sale. Tetris Online's festive puzzle game has moved from a digital download to a retail release with Tetris Party Deluxe. 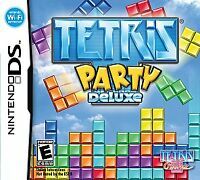 Expanding on the modes and features found within WiiWare's Tetris Party, Tetris Party Deluxe offers more shape-sorting action for up to four players. Six new game types are included, bringing the total number of Tetris variants to 16, from the explosion-making "Bombliss" to the four-player "Vs. Sprint," which has you racing to complete 40 lines. Four previously available modes also offer enhanced elements, such as the ability to create custom "Shadow" puzzles with a built-in edit feature. The DS version of Tetris Party Deluxe supports online play as well as voice chat with the handheld's built-in microphone. This game is Ok in my opinion. 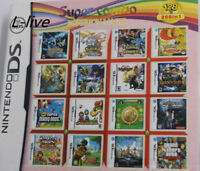 It has multiple party levels to play, mixing it up from the typical Tetris. But I am playing it on a DS Lite and the screen and amount of detail needed is not sufficient. I would prefer to play it on a larger screen. love the service... game as stated.. The different levels are each challenging in their own way, and keep you occupied. AWESOME GAME! FAST PACED...TETRIS AT ITS BEST. I MUST ADMIT I STILL LIKE THE CLASSIC MODE OF TETRIS BEST. OTHER VERSIONS ARE ALSO CHALLENGING AND FUN. GREAT GAME TO PLAY BUT VERY ADDICTING. IT'S HARD TO PUT DOWN ONCE I START PLAYING. A MUST FOR PUZZLE LOVER GAMERS. I bought this product because it resembled what I use to play in the good old days. When I recieved it there was alot more than I thought there would be. Besides that the game is challenging and fun. It also comes with different difficulty lvls which I use to get reintroduced to the game.